Our neighborhood Farmer’s Market opened up this past weekend so we dropped by to pick up some goodies. I brought home fava beans, Mexican mint, and Pipicha (pictured, above right). While I’d never heard of Pipicha before, the farm owner selling the herb explained to me that Pipicha is an herb commonly used in Mexican cooking. It tastes like a cross between cilantro and mint, with hints of lemon and anise. I brought home a bundle of it and had to try it out right away. I recently bought a tortilla press and have been dying to try it out by making homemade tortillas. 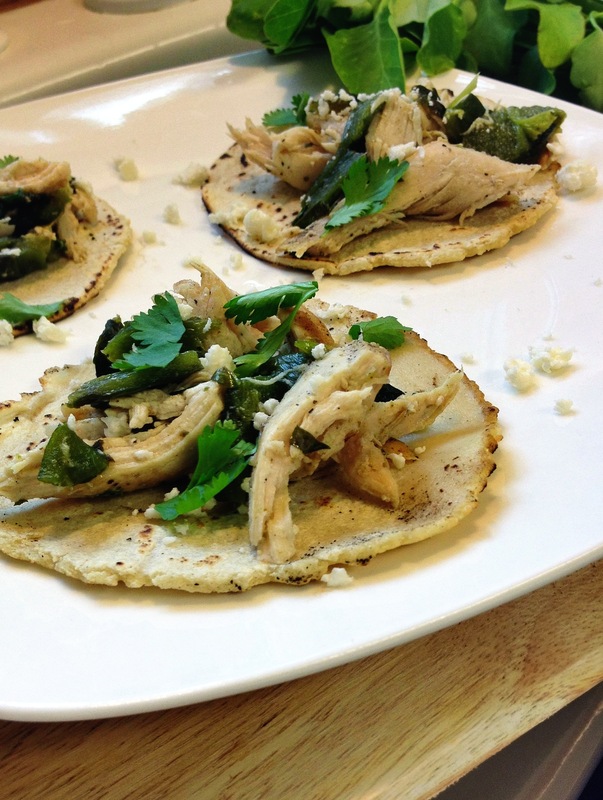 I was shocked at how fast it was to make my own corn tortillas at home. If you don’t have a press, you can still easily make your own tortillas using the bottom of a glass pie plate or simply with a rolling pin. No matter what you use, make sure you flatten the tortilla dough between two pieces of parchment paper for easy handling. To make the tortillas, just buy a bag of Masa Harina (on the Hispanic foods aisle) and mix it with water. The bag will typically say what ratio to use; I mixed 1 & 3/4 cup masa harina to 1 & 1/8 cup water, which made about 12 small corn tortillas. Mix the dough, let it rest for 3o minutes while you prep the rest of your meal, divide the dough into 12 portions and form it into balls, then press using your method of choice into round tortillas. Simply cook them in a skillet over medium-high heat for thirty seconds per side and keep them warm in the oven until you are ready to eat them. For step by step instructions with pictures, see this post. These tacos really hit the spot. I roasted some Poblano Chiles under the broiler and mixed them with some chicken I grilled up in a skillet. I added some of the pipicha to the pan and then de-glazed it with tequila. 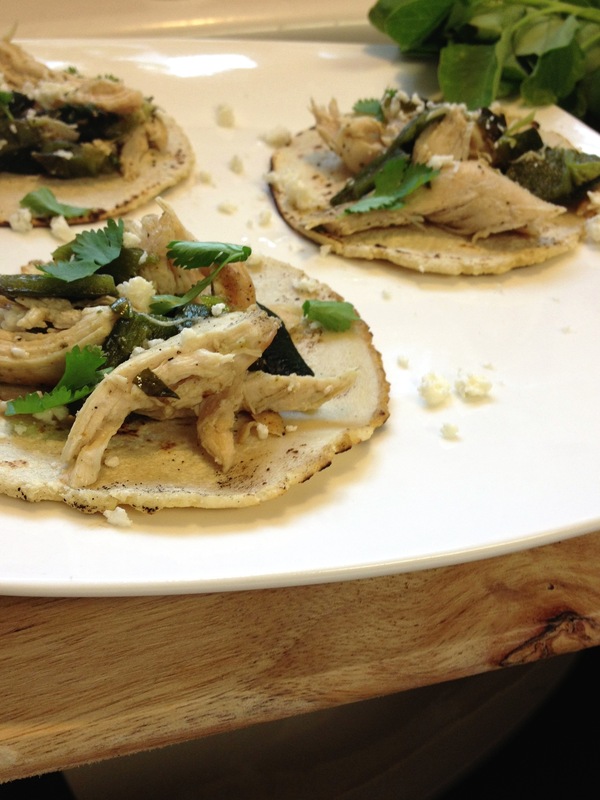 I added the pipicha to the chicken and poblano mixture and kept it warm in the oven while I fried up the tortillas. 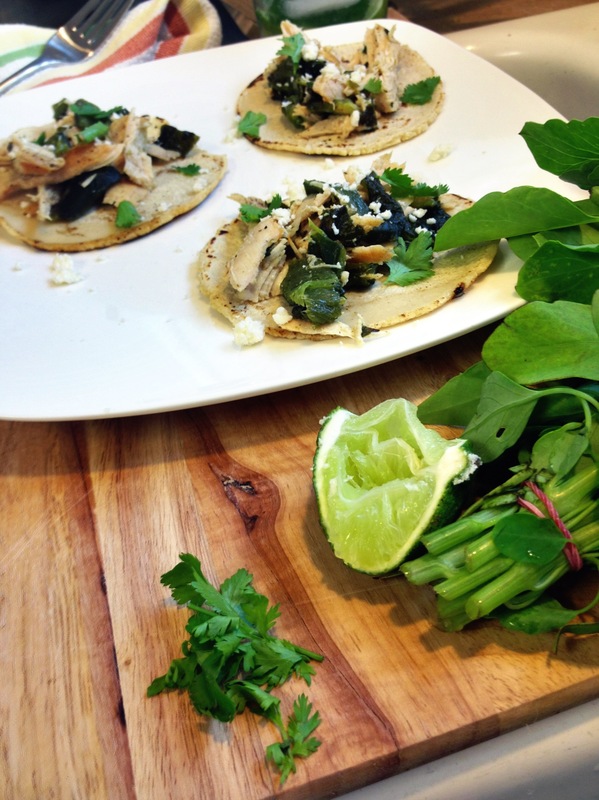 I assembled my little tacos and topped them off with fresh cilantro, more pipicha, and crumbled cotija cheese. This was meant to be enough for four servings (12 tacos, so 3 tacos per person seems reasonable, right?) but the husband and I ate all 12 of them in one sitting. Whoops. Make the tortilla dough by combining the masa harina and water in a medium bowl. Mix with your hands and form it into a large ball. If it is crumbly, add a little more water. If it is sticking to your hands, add a little more masa harina. Let it sit for 30 minutes. Meanwhile, place a heavy pan (preferably cast iron) on the stove and heat to medium-high. Season your chicken breast with salt, pepper, and cumin. Once your pan is hot, add a bit of oil to the pan (olive oil works great) and add your chicken breasts. Let them sear for one minute, then turn them over, turn the heat down to low/simmer, and cover the pan. Set a timer for ten minutes and leave the chicken alone – don’t open the lid! While your chicken is cooking, preheat your oven’s broiler on its highest setting. 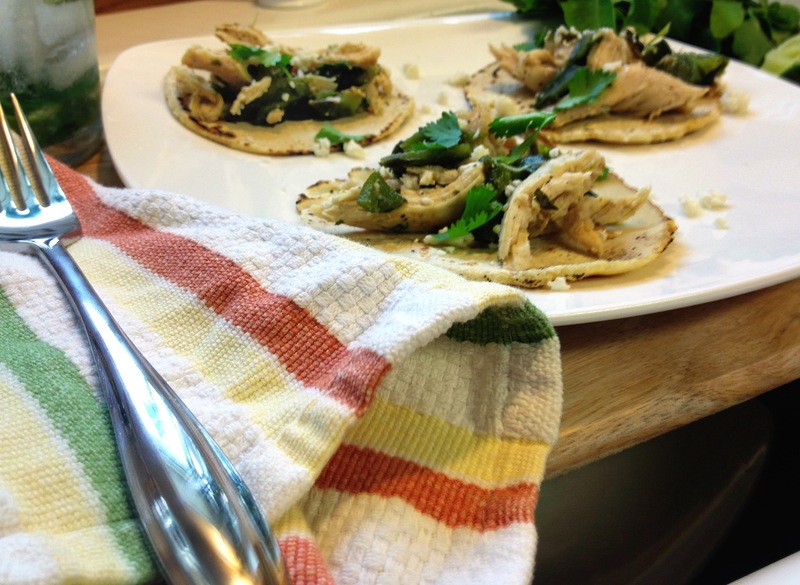 Place your poblano chiles on a baking sheet and place on the highest rack in your oven. Check on your poblanos every minute or so, turning occasionally so the peppers become charred and roasted on all sides. You want the skin to blister but not to burn and turn black. Once they have finished (about ten minutes or so), remove from the oven and turn your oven down to 200 degrees. Place the peppers in a bowl and tent them with tin foil. About this time your kitchen timer for your chicken will go off. Turn the burner off and re-set your timer for another ten minutes. Once this second timer goes off, your chicken is done and ready to be shredded. Remove it to a cutting board and shred with two forks. Now, remove the tin foil from your poblanos and bring them over to your sink. With the cold water running (just a mild stream), peel off the broiled outer skin. It should rub off easily as it has been steaming under the foil. The cold water will also help it peel off. Once you have the skin off, pull the stem out, open up your pepper, and rinse all of the seeds out. Once both peppers are skinless and seedless, move them over to your cutting board and chop them up. Place in a oven-safe bowl with the shredded chicken. Turn your pan back onto medium-high heat and add your chopped pipicha. Stir it around with a wooden spoon to get it mixed in with all the yummy leftover chicken goodness. Keep it moving so it does not burn. Once the pan is nice and hot, pour in some tequila and let it bubble in the pan. Keep working the bottom of the pan with your wooden spoon until the liquid is reduced. If you don’t have any tequila, you could just use a little chicken broth or water. Empty the pan’s contents into the bowl with the chicken and poblanos. Place the bowl in your oven to keep it warm. Divide your tortilla dough into 12 equally-sized balls, rolling with your hands to ensure the dough doesn’t have cracks. Get that dirty pan back on your stove and put the heat back on medium-high. One by one, place a ball into your tortilla press (or under a pie plate) between two pieces of parchment paper. Press into tortillas. As each tortilla is pressed, drop it directly into your hot pan and cook for 30 seconds per side, or until golden brown with spots. Place cooked tortillas on a plate in the oven to keep warm. Once all of your tortillas are cooked, pull all of your goodies out of the oven and assemble into tacos. 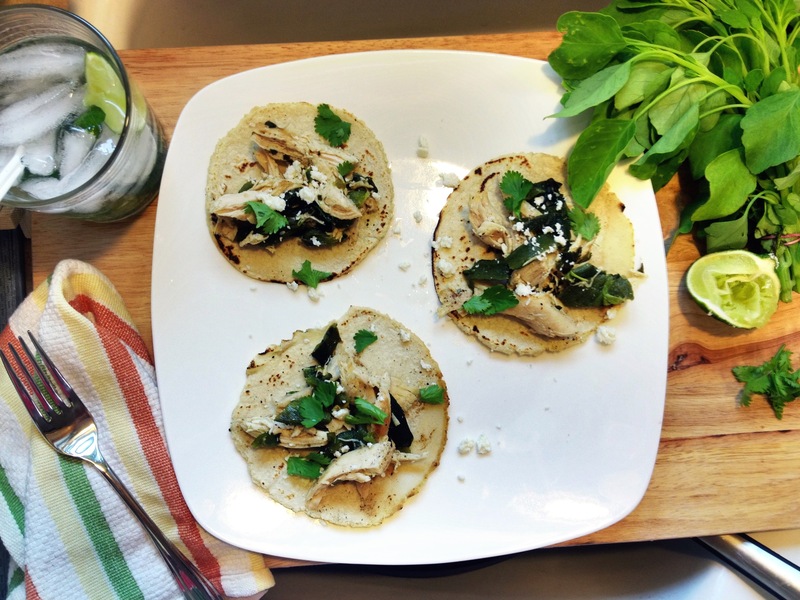 Start with the tortilla on the bottom, top with some of the chicken-poblano mixture, and garnish with cilantro, pipicha, and cotija cheese. What are you looking forward to picking up at the Farmer’s Markets this summer?